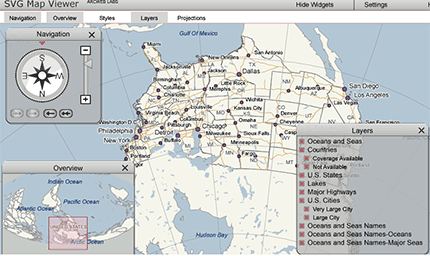 OK, you can now try out the ArcWEB SVG viewer yourself. At least for me, the performance is quite snappy using Internet Explorer and the SVG plug-in (that seems to have been installed by default probably thanks to some Adobe product on my laptop). Quite the busy day for the ArcWeb team, guess the Developer Summit got their juices flowing.